Day 69 – 165 East. Again. Hello Easting, my old friend – it looks like we are here again… (Sung to the tune of that famous song, you know). By the time I have written this blog post Happy Socks shall have blown over our good friend the 165th parallel East once more, thankfully this time in the right direction. We have just entered a painfully short and happily useful window of westerly wind – the east stuff returns after tomorrow. The curiously brilliant thing about the last couple of days of being blown by contrary winds and currents is that even though our track was NW or NNW (i.e. back towards Japan), our distance to the outer edge of Vancouver Island still went down. The more North we go, tiddly pom, the shorter the row, tiddly pom – to steal a tune from my favourite bear Winnie the Pooh. You’ll have to forgive the random asides; I think that’s what all this time alone and a lot of it cabin bound does to you. It does to me anyway, it seems. After a little dip in mojo the last few days after yearning for home – or specifically my girlfriend – I am back in the groove. It is the first time I have been away on a big expedition with a partner at home and, while I gain huge strength from her, I do miss her a lot, especially at times of big milestones or events back home. Still, thank goodness for Iridium – providers of my satellite phones and airtime. It means we can speak daily, morning and night and sometimes more often if I am cabin bound. When I am down she helps me up, when I am up we share in it together and we talk of plans and futures and allsorts in between. Being away while being in a relationship has certainly changed my perspective on future expeditions, in line with the feeling I had while pedalling and paddling out to Japan two years ago that, while I will always adventure, come London on my return home, I shall be ready for home life and a shared one at that. So, here’s to my wonderful soul mate, helping me weather the storms and ride the waves. Just a short time, and we’ll be together once more. That keeps me going. And rowing. P.S: YESSS! We are now back on the right side of 165 E.
Guy & Casey: 2 years old and the world ahead! Happy days. See you in Canada. Roz Savage: Aye, the ocean is one of the best teachers in the world. Judith: Sheroic, I like it! Peter Booth: My dreams at sea are often really weird and very realistic, so I wake up not knowing what is real or not. Linda in Cambridge: Positive vibes and messages of support are always appreciated and very useful – keep them coming, please and thankyou. Gigi Walentini: The non-sleeping last night was all my fault, it seems. I slurped an energy gel a few hours before bed, thinking that it would just be like having some sweets – totally forgot about the caffeine content. Andrew & Judy Henderson: It’s hard to tell if the litter I see out here is from the 2011 tsunami in Japan. There is plenty of plastic with Japanese script on it – but nothing to time-place it. 15 Responses to Day 69 – 165 East. Again. What a beautiful tribute! A happy heart is a wonderful thing to have! Glad you’re headed in the right direction again, and I’m sending all my good easterly thoughts your way. Good to hear you are back on the “right” side of 165E. Let’s hope you don’t have to cross it again. I am so glad that you have someone special in your life and I know she will help to keep your spirits up and help keep you focused. I cannot imagine how lonely it must be for you by times. Yeah for technology that allows you to be in touch with loved ones! Your Canadian friends are pulling for you and sending lots of positive thoughts out to you and Happy Socks. Having love in your heart makes a big difference. It leaves a little bit of you ..where they are…safe and sound on land. It creates strength to draw from and makes the time away very important. Still trying to move CANADA a bit closer to you. Chin up, and all that. Well done you. For having the huge courage it takes to row across a very big puddle 🙂 And for the courage to let us know how much you miss your girl. My ‘wife’ (we are lucky as we can get married in NZ) always struggles when I am away on adventures. In fact she wants to ask your partner how she copes. It is tough for both the adventurer and the ones at home. I know on my adventures my mum and dad also have starred at the map on the computer screen, tirelessly pressing the “refresh” button in the hope that I have moved another millimeter! You are amazing, and your suffering is also the stuff of inspiration for us landlubbers. I’m looking forward to having a chat with you later this month – I’ll make it an interview which is also available to others on line. It warmed the cockles of my heart to read your message. A lovely tribute indeed. Your next expedition on a tandem?? 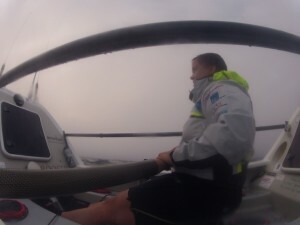 Come on, wind…cooperate! Ooh Ooh! We will be in Victoria next week! Celebrating your ensuing arrival on this marvellous coast with a beverage of the finest Canadian kind. As for love, nothing grander has been invented and all feelings, whether felt close or distant, should be celebrated, cherished and generally relished. Bremma shouts “hooray for love!” and we get so excited when we know that other people do too. Brilliant! Just brilliant! We feel you getting closer and, in-line with the whole upside down spinning toilet water, we have adjusted our cadence to bring you closer to us and into the Canadian orbit. You know we have it right this time eh! Ganbatte! See you soon? Hi Sarah – At least you’re out of sphagetti junction! Here’s a traditional Northumbrian folk song that I have abridged slightly (delete southerly, insert westerly; delete him, insert her!). Blow bonnie breeze, and bring her to me. Glad that Canada is getting closer! Just think of the reunion in Canada and all the celebrations when you come ashore! As has been said above,we found your tribute to your girlfriend very honest and very moving and the love that you share helps move you ever onwards to your goal. We are rooting for you. We also understand it’s not always easy being the ones left at home. Saw your Mum this week and as usual had a good natter and put the world to rights! away from the madness of the world Sarah – what a glorious place to be. Love is something that needs no place you just need to know it’s there. Now ROW!!!!!! Canada is waiting and you need to get there before the continental drift takes it even further North…. Best of luck girl…I know you are going to make the shores of BC. Glad to see you heading in the right direction again and I hope that the wind stays in your favour. Passage weather indicates that the further north you go the wave motion is in your favour [ is this right ]. you pass a third of the way. Your gonner get there one day. And then your gonner make a lotta people happy just to hear you say. So happy to hear you’re managing to find ways to stay in touch with your girlfriend. I can’t imagine what it must be like to face seasickness, homesickness, and lovesickness all at once! Just as well you’re tougher than most. Good to see Romano commenting here too. Romano, what of your next adventure? Ahh, makes you go all mushy. Glad you have such a good home support system and at least skype, iridium and the like allow some communication these days. Bless technology and your lady.